Did you know that Canada Beef, the organization that promotes beef grown across this country, offers a variety of online learning tools designed to help Canadians expand their knowledge of cooking with Canadian beef? This month, the organization is inviting Canadians to Watch.Learn.Cook with Canadian beef using the helpful videos they’ve made available via YouTube, and as a Canada Beef Ambassador I get to help spread the word about these important tools. Have you ever found yourself in the meat section of your local grocery store, staring at enticing cuts of Canadian beef on sale – but unsure of exactly what cuts you should buy and how to cook them? Canada Beef’s 30-second videos can be viewed from your smartphone or tablet in the store, making it easy to get a crash course in preparing different beef cuts. Check out these videos on the perfect pot roast, oven roasting (perfect for last-minute Easter meal prep! ), or even barbecue roasting. If you’re lucky enough to be getting progressively more spring-like weather as we are in Toronto, the last one is definitely enticing for anyone itching to fire up the BBQ, finally. Need more help than the 30-second videos offer? There are two-minute versions of these and many other beef cooking topics available, too. When you’re home from the grocery store and ready to play in the kitchen, these more in-depth videos are perfect. Next time you’re facing an unfamiliar cut of beef that you want to try but need help cooking, check out Canada Beef’s informative video series. If you’re living in or around Toronto, you know that the past month or so hasn’t been kind, weather-wise. But before we know it, the snow will finally disappear and those of us who’ve been hibernating to avoid the cold will be on the hunt for fun things to do. 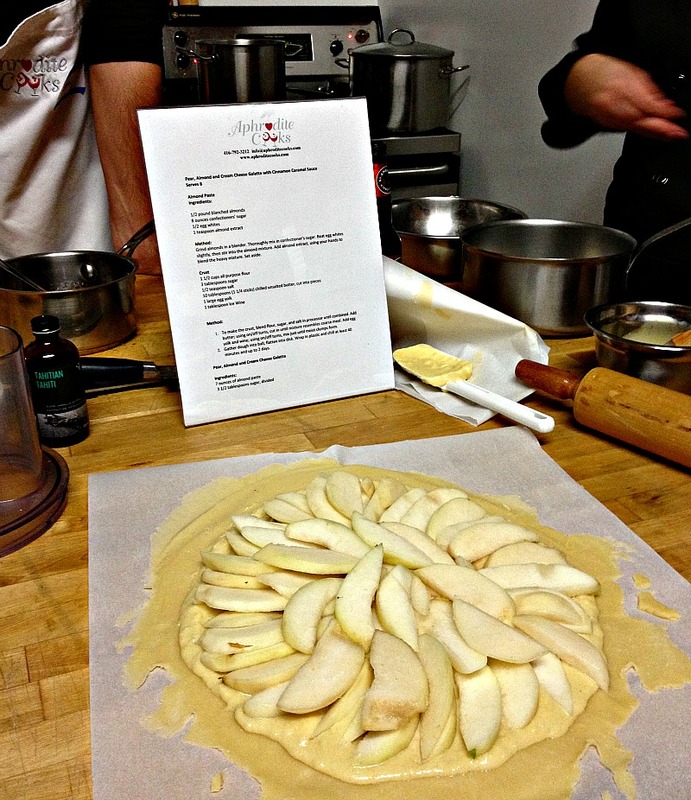 In the fall, Jenny and I had the chance to attend a couples cooking class at Toronto’s Aphrodite Cooks, a culinary studio run by chef Vanessa Yeung. 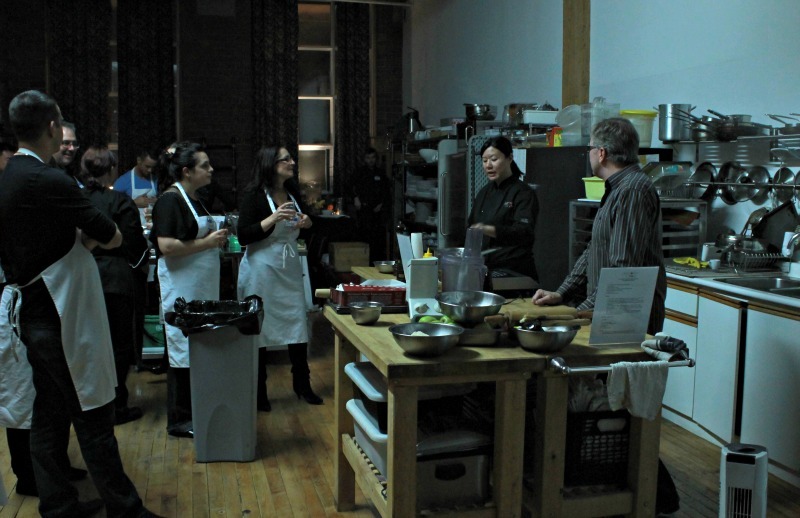 From a loft space in the city’s west end, the Aphrodite team offers catering services, hosts food events such as the Reel Eats dinner we attended recently, and offers themed cooking classes throughout the year aimed at couples and singles looking to learn new skills and explore different cuisines. 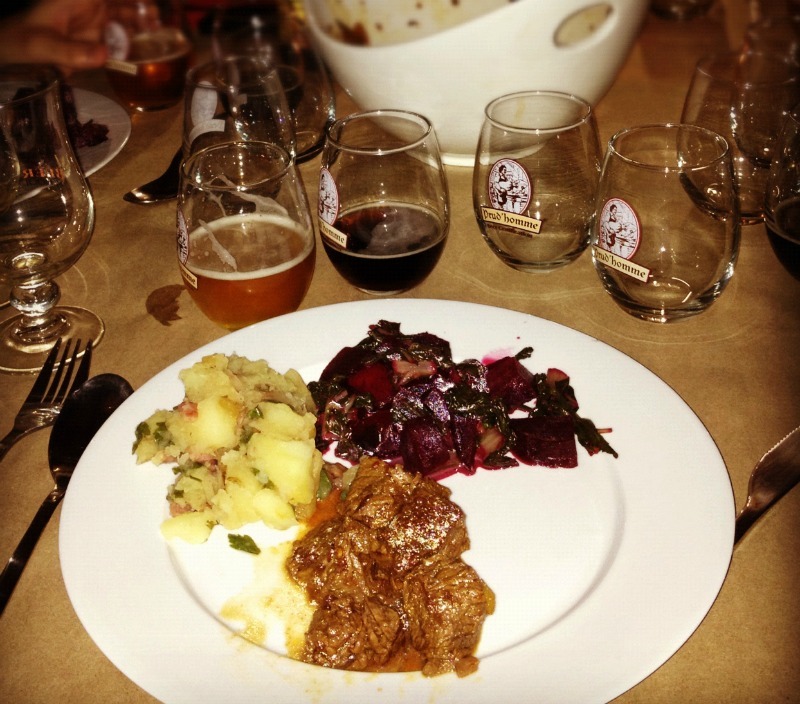 Our couples cooking class was focused on pairing beer with food. Chef Yeung had invited Roger Mittag, aka the Beer Professor to share his expertise and help determine which beers matched with the meal we were going to prepare: butternut squash and apple bisque; German potato salad; beets with stout and sautéed beet greens; a spicy chipotle beef stew; and, for dessert, pear, almond and cream cheese galette with cinnamon caramel sauce. As we walked in and were each handed an apron and a glass of beer, it was immediately clear the cooking classes at Aphrodite are hands-on, which was great to see. There’s nothing like actually being tasked with chopping, stirring and cooking if you really want to learn how to prepare new dishes. And all the work makes it all the more satisfying to sit down together as a group at the end of a cooking class and eat the food you helped create, as we did at the Aphrodite Cooks class. Mittag is an actual beer professor – he teaches at Humber College’s School of Hospitality. As we prepared our meal, he gave us a crash course on beer, the beer-making process and how different malt roasts affect the flavour of the finished product. He brought along five different beers for us to sample with our meal. As a beer lover, I’m always happy to discover a new beer, and Roger’s selection helped me do just that: Dominus Vobiscum Lupulus, a Belgian-style microbrew that’s lighter and hoppier than most Belgians I typically turn to, and surprisingly easy to drink considering its 10% alcohol content. 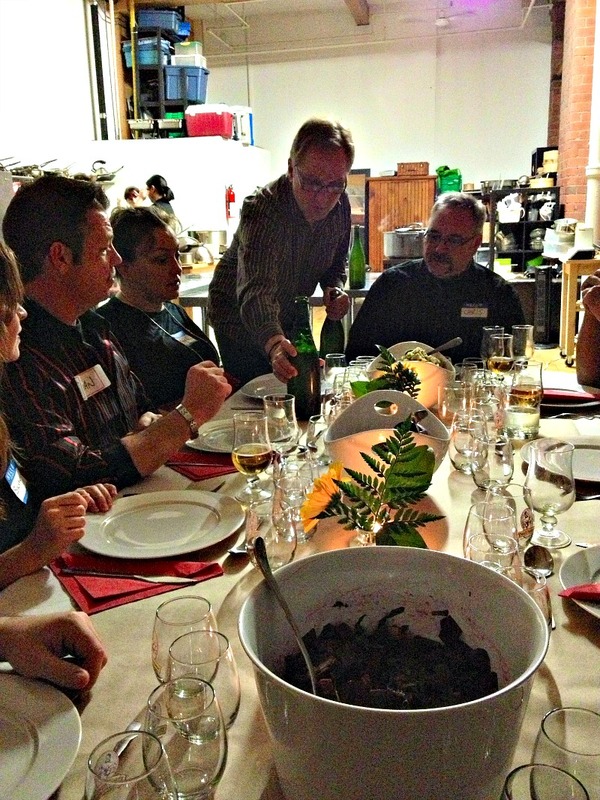 Of course, a great cooking class is incomplete if you’re not given the tools needed to recreate the meal at home. Attendees at the Aphrodite Cooks couples class were emailed digital copies of recipes for all the dishes we prepared, as well as a list of all the beers sampled. No note-taking needed! Check out the Aphrodite Cooks website for a listing of upcoming couples cooking classes (new ones are added to the schedule throughout the year), as well as some of the other great cooking workshops planned (if you’re looking for a fun Mother’s Day experience, for example, consider taking your mom to the upcoming Portugese Mother’s Day brunch). For the past couple of years, we’ve been lucky enough to attend the Canadian regional portion of the annual S. Pellegrino Almost Famous Chef Competition. The competition brings young culinary students from around North America together to compete and showcase their skills as the next generation of great restaurant chefs. This year’s Canada regional competition is taking place next Monday in Toronto. 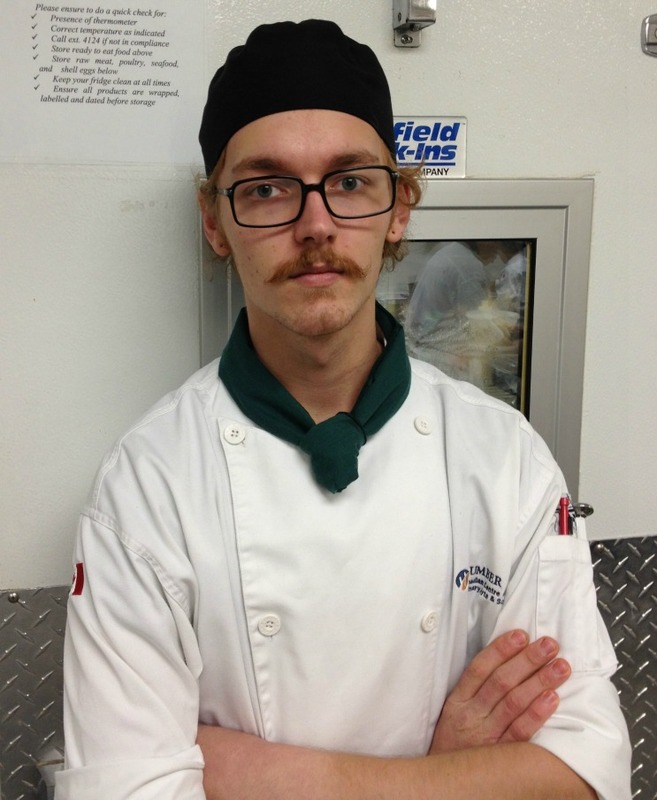 I had the chance to chat with Timothy Van Ryzewyk, a culinary student representing Toronto’s Humber College in the competition, about what drives him to create great food. You can read his thoughts below. But first, an exciting contest: We have a $150 gift certificate, good for dinner for two at Mark McEwan’s Fabbrica restaurant in Toronto, courtesy of S. Pellegrino Almost Famous Chef Competition. I recently had the chance to eat at Fabbrica and chat with Mark McEwan, and I can vouch for the food. To win, leave a comment below telling us what your most memorable restaurant meal was in the past year. We’ll draw a lucky winner from all comments left here by 11:59 p.m. on Saturday, February 23. UPDATE: Congratulations to Victoria, who was randomly chosen as our winner with the help of Random.org! What drew you into cooking? I have always been passionate about cooking; my mother still brings up photos of me as a child helping in the kitchen. Everyone has to eat, so my goal is to give them a dish that they want to keep eating over and over again. I love the kitchen atmosphere – whether it be the long hours, hard work and dedication everyday or the occasional stressful day, it all comes with the job and I just couldn’t see myself behind a desk. From the industry standpoint I would say Chef Susur Lee is my influence. His extremely hard work throughout his career got him to the point he is at today. From a food standpoint my biggest influence is my Mom. If it were not for her allowing me to be a part of cooking family dinners and holiday meals, I never would have discovered my calling. How would you describe your preferred cooking style? I enjoy the fusion style of cooking because you can take bits and parts of different styles you have learned and bring them all together to make a very ”out of the box dish” using very different cooking techniques. Introducing and discovering new food combinations and preparation techniques is definitely something that really appeals to me. 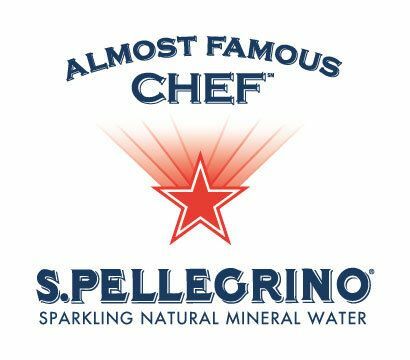 How are you preparing for the S. Pellegrino Almost Famous Chef Competition? 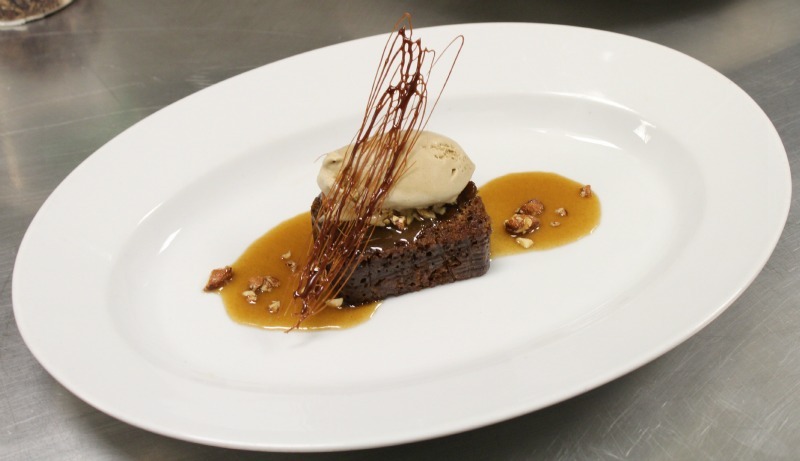 I have been practising my signature dish at Humber College and at home at least twice a week. When I sleep, I dream of my dish so that on the day of the competition, I can close my eyes and produce my dish. You write comedy in addition to training as a chef. How do you think your creative and humourous side helps in the kitchen? The comedy I write is based upon sketches. I am currently working with a few friends on writing and acting in a sketch comedy show that we plan to have ready to send out by the end of the year. Comedy writing is a great utensil in the culinary world because there will always be moments when you’re in the heat of things and someone loses their cool. Being able to defuse that tension can really save the day during a busy service – especially in my case, where I am currently the head expeditor at Lee Restaurant. Having a constant creative outlook makes it very fun creating menus for school projects or for a competition. You don’t limit yourself; at the same time you’re being logical with the food choices you make. Jenny and I aren’t huge fans of Valentine’s Day. We rarely mark the occasion with cards or flowers, and definitely steer clear of restaurants offering (usually overpriced) Valentine’s Day-themed prix fixe menus. 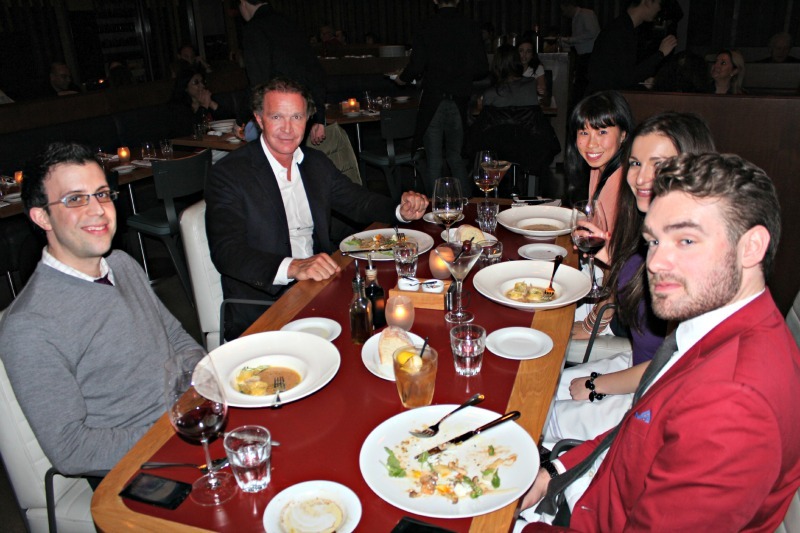 So, when I was invited to have dinner with chef Mark McEwan at his newest Toronto restaurant, Fabbrica, to preview the kitchen’s Valentine’s Day menu, I was initially skeptical. But, then again, it’s not every day the chance comes along to sit and break bread with a man who is one of Toronto’s best-known chefs and a host of Top Chef Canada on the Food Network. As we sat and read over the special Valentine’s Day menu that will be available to Fabbrica diners between February 14 and 17, McEwan put me at ease by saying that he’s not a fan of Valentine’s Day menus built around “cheese” like heart-shaped food and chocolate incorporated into each dish for no good reason. The dishes on the $55 prix fixe ($85 with wine pairings) were developed around the same ethos McEwan says Fabbrica’s regular menu is built: good, honest Italian food done right. 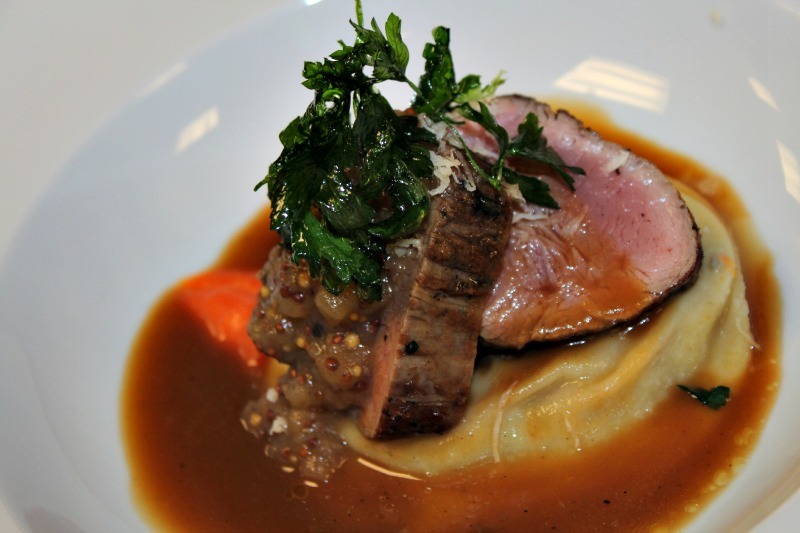 Seared veal tenderloin on braised brisket raviolo and carrot-parsnip puree. A great dish! Since graduating from culinary school at George Brown College in 1979, McEwan has been at the forefront of Toronto’s dining scene, owning and/or running the kitchen at some of the city’s most popular restaurants and hotels—many of which count wealthy residents and visiting movie stars as frequent diners. But despite the flashy clientele, McEwan says he’s always made sure his menus focused on the classics rather than what’s trendy. And he thinks that’s what diners want. Even in the food trends that have taken Toronto by storm over the past year or two—think tacos, Southern barbecue and rustic Italian—McEwan says the key elements are authenticity and time-honoured technique. McEwan says that even the projects that have brought him into the national spotlight—his Food Network shows The Heat and Top Chef Canada—have been real and honest. Of the former, which followed him as he worked to open his eponymous, upscale Toronto grocery store, McEwan, he says the show was an honest portrayal of the experience, giving viewers a glimpse at the opening of a business and the mistakes made along the way. And he says he’s enjoyed working on Top Chef Canada because, unlike some other food-based reality shows, this one is focused on good cooking and passionate chefs; “It’s not about a basket of weird ingredients,” he says, referring to Chopped—a show I admitted to him that I’m a pretty devoted fan of. Like his restaurants, there’s a definite polish to Mark McEwan, a sense that he’s always ready to perform. But after spending a couple hours with him, talking about food, sports (he’s a Buffalo native and, like me, a long-suffering Bills fan) and ideas for Toronto’s future (he’s a big believer in the current plan for a downtown casino), I was definitely left with a feeling of authenticity in both the man and his food. Everyone has his or her own dirty little secrets. Some bloggers even write about those secrets. Up to now, I haven’t been one of those bloggers. Here’s my dirty little secret for today: I’m quite comfortable in the kitchen, and there are few dishes I haven’t attempted to make, or wouldn’t consider attempting. But I’d never made a roast of beef until recently. I have no idea why, really. In theory, it’s dead simple. You find yourself a large cut of beef, prep it with a spice rub, or even just salt and pepper, and throw it in the oven for several hours until it’s done. Really, a roast does most of the cooking for you. Of course, that may be why it took me so long to make my first beef roast. I like to play in the kitchen. My brain rationalizes cooking as an active thing—chopping, mixing, stirring. Putting something in the oven or a slow cooker and leaving it be just kind of freaks me out, I guess. But my most recent assignment as a Canada Beef brand ambassador was to cook a roast of beef—which was exactly the nudge I needed to finally cross this one off my never-cooked list. Canada Beef’s consumer information site, BeefInfo.org, has a ton of useful tips on making a roast of beef—everything from what cuts to look for, to how long to cook the roast, and of course, recipe ideas. I certainly scoured the site as I was figuring out how to tackle this meal. One of the most daunting, and eye-opening, elements for me was how to buy a roast. Frankly, I always thought that a beef roast was a beef roast. But it turns out that there are several roast cuts you can choose from, which come from different parts of the cow. 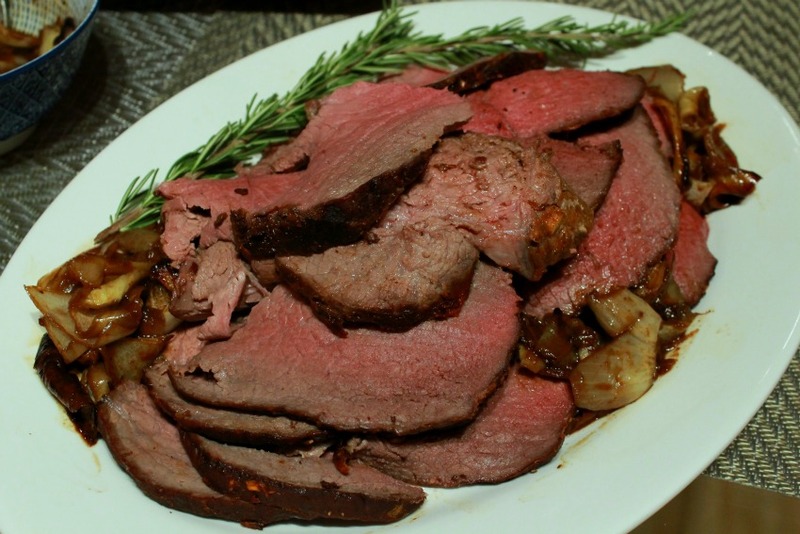 Premium roasts come from the loin and rib; they’re more tender, but more expensive. Then there are cuts from the hip. They’re leaner and cheaper. I opted for the latter category, buying a sirloin tip roast. 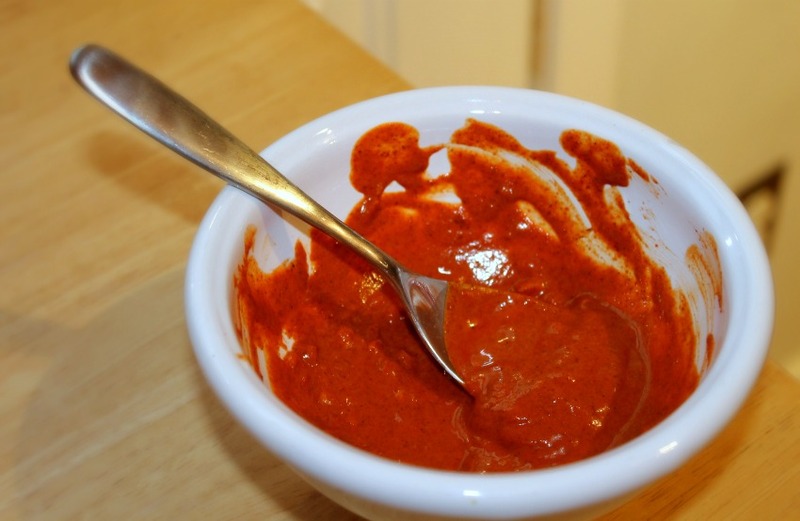 I made a wet rub for my roast, mixing 1.5 teaspoons of smoked paprika, a half teaspoon each of cinnamon and cumin, one minced garlic clove, a tablespoon of Dijon mustard and a few generous grinds of salt and pepper, plus a few drops of water to bring everything together. I covered the roast in the rub and let it sit in the fridge for a couple of hours so the flavours could work their way into the meat. To cook my roast beef, I followed Canada Beef’s tip of starting the process by oven-searing the beef. Place the roast in a shallow roasting pan, and cook uncovered in a 450 F oven for 10 minutes, before reducing the heat to 300 F for the rest of the cooking time. To be honest, I didn’t think this got the best sear on the meat and I’ll try their alternate suggestion next time—searing on the stove top in a bit of oil, before putting it into the oven at 300 F.
From there, as Tom Petty once sang, the waiting is the hardest part. 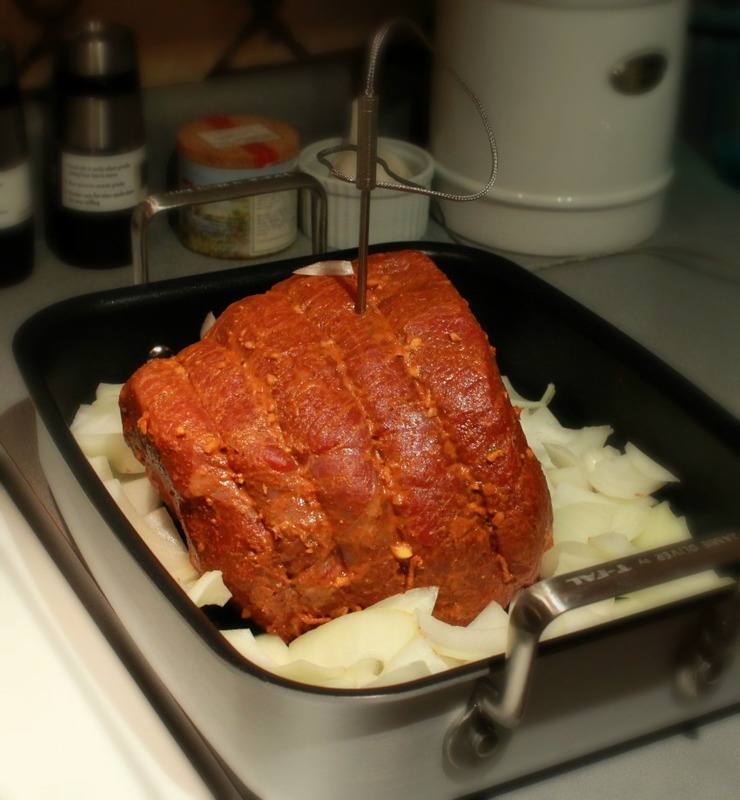 Cooking time will depend on the weight of your roast and the degree of doneness you want from your meat. Check out the cooking time chart here for a guideline, but a foolproof method is to use a digital meat thermometer (the team at Canada Beef were kind enough to send all their beef ambassadors one to cook with); you select the type of meat you’re cooking, the doneness level you want (rare, medium or well-done), and the thermometer lets you know when your roast has reached the target internal temperature. When my roast was done—I bought a five-pound roast to serve a small crowd, and was going for medium-well, so the cooking time was a little over three hours—I let it sit for 20 minutes or so before slicing. This is an important step if you want your roast to be tender and juicy after you cut it. Turns out that all my food abandonment issues were for naught. The roast turned out great, and it gave us plenty of leftovers for lunch. And, really, what’s better than an easy, hands-off dinner that’s sure to leave you with bonus meals? When most people think about steak, they picture a thick-cut, well-marbled piece of beef cooked on a hot grill and enjoyed, maybe with some mushrooms, Caesar salad and a glass of red wine. While this isn’t wrong, it’s only one piece of the whole steak picture. Grilling Steak: This category includes beef cuts that are tender and flavourful enough that they can be prepared very simply and cooked on a BBQ or indoors in a hot cast iron pan. When I’m craving beef, this is often what I want to cook. A great sirloin can seasoned with just a bit of salt and pepper, and maybe a drizzle of olive oil, then cooked to a perfect medium-rare. It’s a perfect meal for a beautiful summer evening, as far as I’m concerned. Check out this simple grilled steak recipe from the Canadian Beef website. Marinating Steak: This is a steak that can be cooked on the grill, but needs a little more prep work to make the meat tender and flavourful. Cuts in this category are perfect candidates for your favorite marinade. Go Mexican with Carne Asada, or try some Asian flavours. Simmering Steak: Simmering steaks need to be cooked slowly in liquid to ensure they come out fork-tender. Check out these simmering steak recipes for one-pot meals you can leave to cook in the oven or the slow cooker while you spend time doing other things. If you want to learn more about different types of steaks and pick up a few cooking tips and recipe ideas, consider joining Canadian Beef for a Twitter party on Thursday September 13th at 8:30 p.m. EST. Follow the discussion using the hashtag #loveCDNbeef. I’ve been given a set of four CUTCO steak knives to give away to one lucky reader of Communal Table. I have a set of these myself, and they’re sharp and a good weight, with a comfortable grip – everything I look for in a good steak knife. 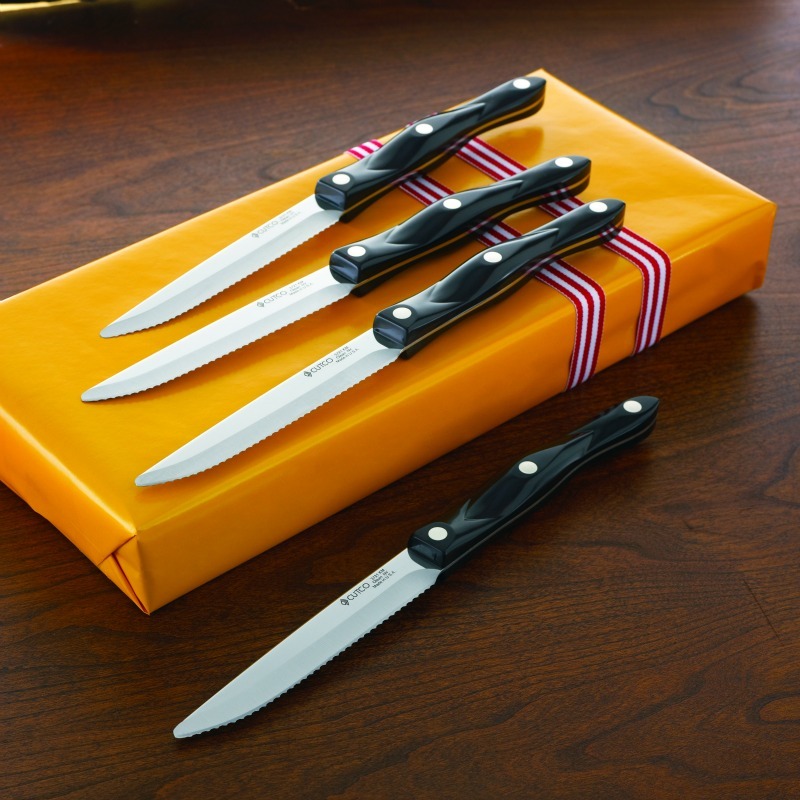 To win, just leave a comment telling me what you’d use your new steak knives for. A simple grilled steak? A blade steak simmered slowly in beer? Maybe teriyaki-marinated flank steak? Whatever it is, let me know. I’ll draw a winner from all comments left by noon EST next Sunday, September 16. Good luck!